Everyone wants to live a meaningful life. Long before our own day of self-help books offering twelve-step programs and other guides to attain happiness, the philosophers of ancient Greece explored the riddle of what makes a life worth living, producing a wide variety of ideas and examples to follow. 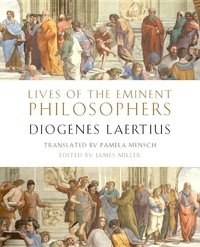 This rich tradition was recast by Diogenes Laertius into an anthology, a miscellany of maxims and anecdotes, that generations of Western readers have consulted for edification as well as entertainment ever since the Lives of the Eminent Philosophers, first compiled in the third century AD, came to prominence in Renaissance Italy. To this day, it remains a crucial source for much of what we know about the origins and practice of philosophy in ancient Greece, covering a longer period of time and a larger number of figures-from Pythagoras and Socrates to Aristotle and Epicurus-than any other ancient source.